Projects Tents is a group of like-minded people who have united to create public awareness of fundraising efforts to raise money for assisting some 8,000 Haitians each day who are contributing to the country’s rehabilitation. 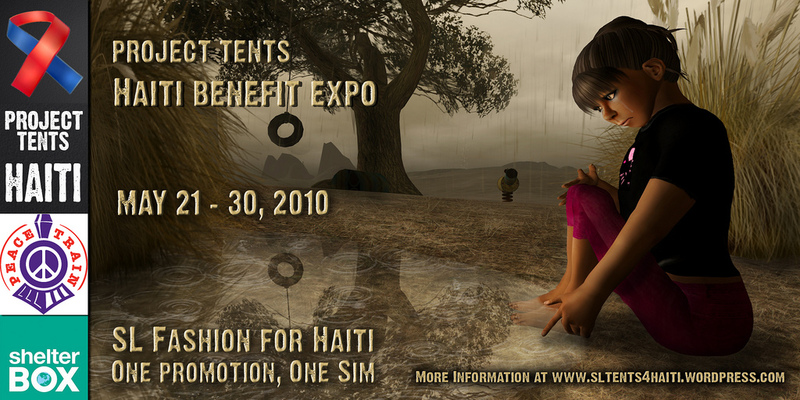 Working toward that goal, Project Tents is putting on a SL Fashion Expo starting May 21st through May 30th, 2010. The event will be open to bloggers for a preview the day prior to the event. The event will raise funds that will be donated through Peace Train to shelter BOX. The Peace Train Charitable Trust is a federally recognized public charity in the United States (501 c 3) whose mission is to create lasting peace through mobilizing dialogue, support and learning with peace organizations around the world. They use a variety of technologies that enable them to create events that connect the virtual public with real world causes. More than 60 vendors have already accepted the opportunity to participate in this exciting event. Vendors will include Tres Beau, Alatiel Fashions, Angel Dessous, The Graceful Lily, Orage Creations, Donna Flora, Prism, Azul, Gems & Kisses, Chantkare, Exclusiva and Detalz just to name a few. This opportunity will allow you to virtually connect with others that want to reach out and make a difference, all from the ease and convenience of your home. Please plan to join Project Tents in this fundraising effort May 21st – May 30th.